One of the benefits of living in San Diego is the easy access to viewing marine life. A short trip to the beach can result in dolphin-spotting on any given day. The Children’s Pool in La Jolla has the seals lounging on the beach and playing in the waves, and there are ample opportunities, ranging from free to fancy, to view the sea’s gentle giants: whales. Visitors to San Diego are fortunate enough to spot whales from land and sea. Whale watching season traditionally occurs from December through April when California gray whales journey from the chilly Alaskan seas to the warm water lagoons of Baja California. It’s a majestic sight to see the world’s largest mammals cutting through the water and making their way south, but there are also other species of whales and dolphins that are equally as stunning that can be seen year round in San Diego. Several whale watching companies have expanded their range of sea outings, and visitors now have the unique opportunity to glimpse all types of marine life year-round on cruises out of San Diego’s harbors. In the fall and summer months, whale watching excursions also tout the opportunity to see humpback, fin and minke whales, along with frequent year-round sightings of bottlenose, pacific white-sided and common dolphins. Depending on how much time you have, how sturdy your sea legs and how flush your budget, there’s a San Diego whale watching experience for everyone. 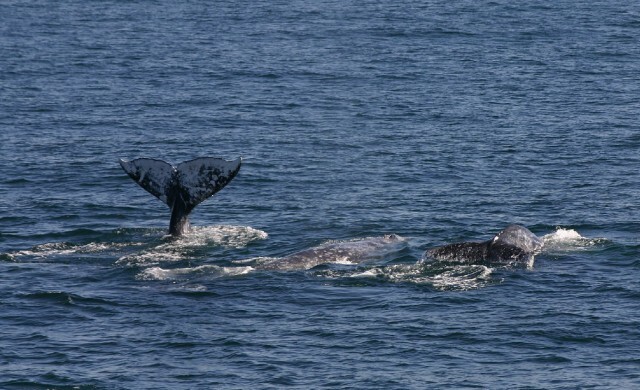 Take a ride with Flagship Harbor Excursions and sail the ocean blue in search of whales. Land Lubbers can spot whales with binoculars (or great eyesight) from coastal high points like Cabrillo National Monument, located on the panoramic Point Loma peninsula, Torrey Pines State Reserve or from the Birch Aquarium at Scripps‘ outdoor tide-pool plaza, overlooking La Jolla’s shoreline and offering an excellent vantage point for viewing the gray whale’s epic journey. If you want to set sail to try to get up close and personal with whales, there are a variety of options from regularly scheduled public cruises to private yachts and sailboat charters, to an authentic 25-ft. Navy SEAL Rigid Inflatable Boat for a group of 6 to a single-seat kayak tour. Hornblower Cruises and Events has new tour for blue whale watching in July and August. Next Level Sailing and the Maritime Museum of San Diego are offering a unique whale watching experience aboard the yacht America, a historic replica of the world’s first America’s Cup winner. The Birch Aquarium at Scripps partner with Flagship Cruises & Events to venture out on twice-daily public cruises from San Diego Bay to locate gray whales. 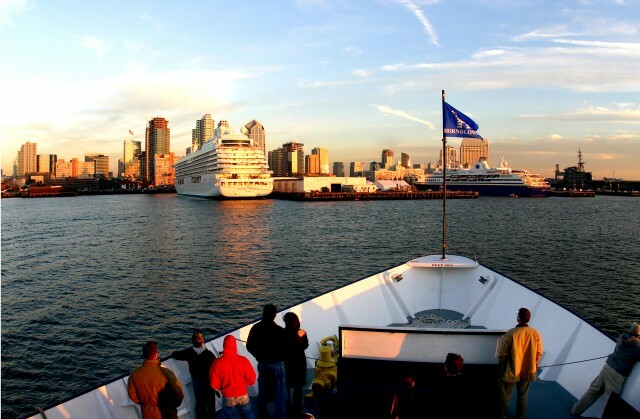 Hornblower Cruises and Events offers 3.5-hour deluxe whale watching adventure cruises in partnership with the San Diego Natural History Museum. 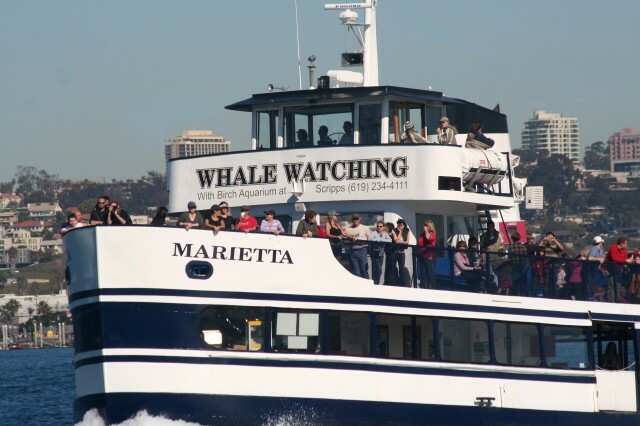 Hornblower just added a Blue Whale Watching tour on weekends in July and August. Throughout the year, H&M Landing offers several whale-watching and marine-adventure excursions. San Diego Whale Watch offers year-round whale watching excursions boarding from Seaforth Landing aboard The Privateer, a unique boat built specifically for whale watching. 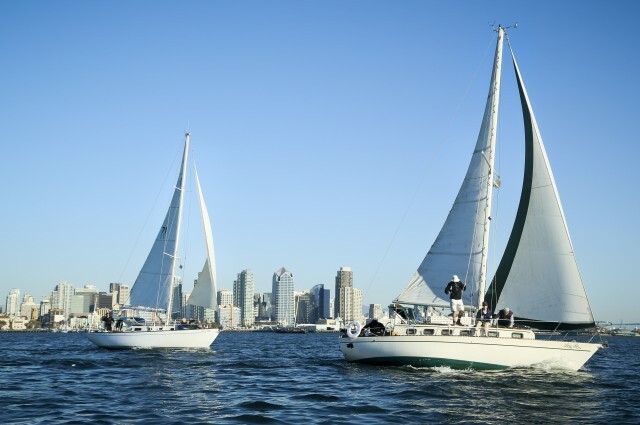 Sail San Diego offers daily whale watching excursions aboard three sleek 40-ft. Catalina boats. Captain Rod Jones’s Fun Cat Sailing Catamaran Adventures offers small group catamaran tours exploring San Diego’s beautiful ocean and bay in search of whales and other marine life. San Diego Sailing Tours offer daily public whale watching tours as well as private charters from San Diego Bay to the open sea. San Diego Sailing Tours offers two classic sailing yachts, the vintage 1967 Lei Lani and the Lora Lei, built-in California in 1991. San Diego Boat Tours offers several private charter boats for you to reserve and design your own tour experience. Seven Seas Adventures offers a large fleet of catamarans and monohulls for private charter from 3-hour cruises to overnight adventures at sea. Adventuress Luxury Catamaran is a 60-foot yacht that can accommodate up to 48 guests, has a 75 bottle wine locker and is available exclusively for private charter. The six-passenger Rigid Inflatable Boat – RIB Ride – tour can get extremely close to marine life and are easily maneuverable around the whales. For the truly adventurous seeker of whales, take a RIB ride or try paddling out on a tour with one of La Jolla Shores kayak rental companies and get close enough to see if the giants are really that gentle up close. 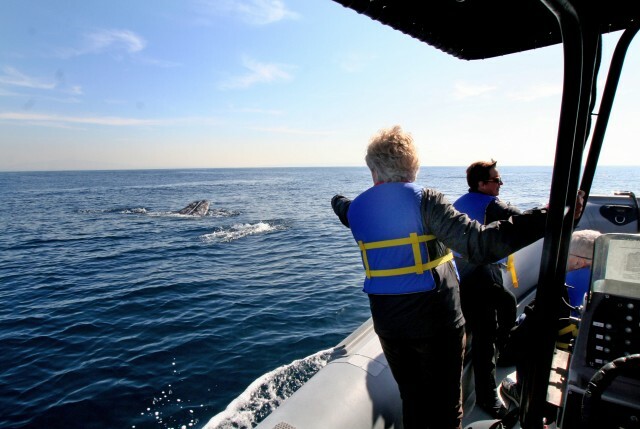 Everyday California (formerly OEX Dive & Kayak La Jolla) offers a 2-hour whale watching kayak tour that allows guests to paddle within 40 feet of gray whales, seals and sea lions. Experience a thrilling whale and dolphin watching excursion year-round aboard an authentic 25-ft. Navy SEAL Rigid Inflatable Boat (R.I.B.) with Adventure RIB Rides. La Jolla Kayak provides close encounters with gray whales and other marine life including sea lions, garibaldi and leopard sharks. Hike Bike Kayak offers three-hour whale watching tours through the La Jolla Ecological Reserve near La Jolla Shores. What’s your favorite place in San Diego to spot a spout?